Pentagram designer's, Angus Hyland and Fabian Herrmann have designed the hardback edition of Penguin Books Quantum of Solace: The Complete James Bond Short Stories. 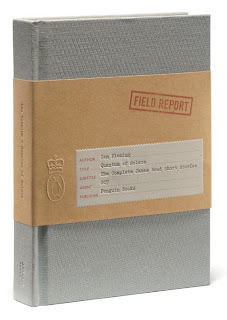 The book collects together all of Ian Fleming's Bond short stories in a single volume. 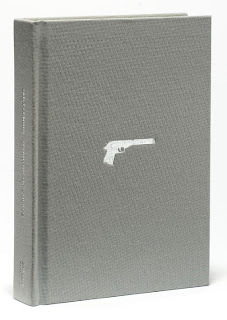 Hyland created a cloth-covered hardback with cover imagery restricted to a silver foil stamped image of Bond's infamous Walther PPK. A subtle diamond pattern is debossed on to the boards, which combined with deep burgundy endpapers evokes the discerning elegance of Bond's world. An embossed manila bellyband with typewritten cover information on the label evokes the official documents of the period. Click on image to enlarge.